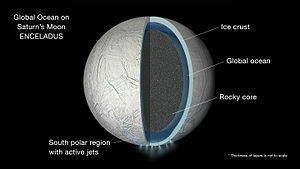 Life Investigation For Enceladus (LIFE) was a proposed astrobiology mission concept that would capture icy particles from Saturn's moon Enceladus and return them to Earth, where they could be studied in detail for signs of life such as biomolecules. The LIFE orbiter concept was proposed by a team led by Peter Tsou to NASA's 13th Discovery Mission solicitation, but the mission was not selected by NASA for Phase-A design study. Artist's impression of possible hydrothermal activity on Enceladus. Enceladus is a small icy moon with jets or geysers of water erupting from its surface that might be connected to active hydrothermal vents at its subsurface water ocean floor, where the moon's ocean meets the underlying rock, a prime habitat for life. The geysers could provide easy access for sampling the moon's subsurface ocean, and if there is microbial life in it, ice particles from the sea could contain the evidence astrobiologists need to identify them. Enceladus's south pole - Geysers spray water from many locations along the 'tiger stripes' feature. The 15-year LIFE mission would use a 'Tanpopo' aerogel collector similar to the one NASA used in the Stardust sample return mission to return cometary dust in 2006. The proposed spacecraft would enter into Saturn orbit and enable multiple flybys through Enceladus's icy plumes. After spending about two years in orbit as slow as 2 km/s around Saturn, LIFE would use its propulsion system to escape Saturn and begin the ~4.5 year long voyage back to Earth with the collected particles in a return capsule. The spacecraft may sample Enceladus's plume, the E ring of Saturn, and the Titan upper atmosphere. The samples collected would be returned to Earth for extensive analyses. ↑ 1.0 1.1 1.2 Wall, Mike (December 6, 2012). "Saturn Moon Enceladus Eyed for Sample-Return Mission". Space.com. Retrieved 2015-04-10. ↑ 2.0 2.1 2.2 2.3 Tsou, Peter; Brownlee, D.E. ; McKay, Christopher; Anbar, A.D.; Yano, H. (August 2012). "LIFE: Life Investigation For Enceladus A Sample Return Mission Concept in Search for Evidence of Life". Astrobiology. 12 (8): 730–742. Bibcode:2012AsBio..12..730T. doi:10.1089/ast.2011.0813. PMID 22970863. ↑ 3.0 3.1 Tsou, Peter; Anbar, Ariel; Atwegg, Kathrin; Porco, Carolyn; Baross, John; McKay, Christopher (2014). "LIFE - Enceladus Plume Sample Return via Discovery" (PDF). 45th Lunar and Planetary Science Conference. Retrieved 2015-04-10. ↑ Tsou, Peter (2013). "LIFE: Life Investigation For Enceladus - A Sample Return Mission Concept in Search for Evidence of Life". Jet Propulsion Laboratory. Archived from the original (.doc) on 2015-09-01. Retrieved 2015-04-10. ↑ "NASA announces five Discovery proposals selected for further study". The Planetary Society. September 30, 2015. Retrieved 2017-01-02. ↑ Ocean Within Enceladus May Harbor Hydrothermal Activity. March 11, 2015. ↑ Platt, Jane; Bell, Brian (April 3, 2014). "NASA Space Assets Detect Ocean inside Saturn Moon". NASA. Retrieved 2014-04-03. ↑ Iess, L.; Stevenson, D.J. ; et al. (April 4, 2014). "The Gravity Field and Interior Structure of Enceladus". Science. 344 (6179): 78–80. Bibcode:2014Sci...344...78I. doi:10.1126/science.1250551. PMID 24700854. Retrieved 2014-04-03. ↑ Amos, Jonathan (April 3, 2014). "Saturn's Enceladus moon hides 'great lake' of water". BBC News. Retrieved 2014-04-07. ↑ Witze, Alexandra (March 11, 2015). "Hints of hot springs found on Saturnian moon". Nature News. Retrieved 2015-04-07. ↑ Anderson, Paul Scott (March 13, 2015). "Cassini Finds Evidence for Hydrothermal Activity on Saturn's Moon Enceladus". AmericaSpace. Retrieved 2015-04-07. ↑ Gronstal, Aaron (July 30, 2014). "Enceladus in 101 Geysers". NASA Astrobiology Institute. Archived from the original on August 16, 2014. Retrieved 2015-04-08. ↑ 14.0 14.1 14.2 Yano, H.; Strange, Nathan; Dissly, Richard; Kanik, I. (June 18, 2013). Tsou, Peter; Brownlee, D. E.; McKay, C. P.; et al., eds. Low Cost Enceladus Sample Return Mission Concept (PDF). Low Cost Planetary Missions Conference #10. ↑ Gilster, Paul (May 28, 2014). "Proposed Europa/Io Sample Return Mission". Centauri Dreams. Retrieved 2015-04-10. ↑ LePage, Drew (March 27, 2014). "A Europa-Io Sample Return Mission". Drew ExMachina. Retrieved 2015-04-10. ↑ Kane, Van (December 2, 2014). "Selecting the Next Creative Idea for Exploring the Solar System". Planetary Society. Retrieved 2015-02-10. ↑ Dreier, Casey; Lakdawalla, Emily (December 2, 2014). "Selecting the Next Creative Idea for Exploring the Solar System". Planetary Society. Retrieved 2015-02-10. This article uses material from Life Investigation For Enceladus on Wikipedia (view authors). License under CC BY-SA 3.0.